The price of necessities hits us all in a vulnerable spot. If the price of airfares to New Zealand rises, it doesn't affect my life--except that my dream vacation to New Zealand looks a little less possible. But if the price of food and gasoline rise, I notice it immediately, and it cuts into the family budget for entertainment and other pleasant activities. 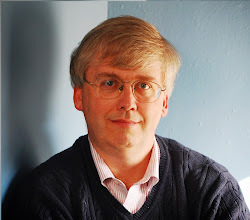 In an Economic Commentary written for the Federal Reserve Bank of Cleveland (October 6, 2014), LaVaughn M. Henry looks at "Income Inequality and Income-Class Consumption Patterns." By his measure, those with higher incomes can (unsurprisingly) spend a far smaller share of their income on necessities as compared to luxuries. However, all income groups are spending a lower share of their income on necessities than they did several decades ago. Henry looks at data from the Consumer Expenditure Survey, which divides up what people buy into various categories. He then classifies some of the categories as more likely to be disproportionately "necessities" and others as disproportionately "luxuries." for example, necessities include food at home, rent, utilities, health care, education, gasoline, and household supplies. Luxuries include food away from home, entertainment, household furnishings, "other lodging," and others. His complete list appears at the bottom of the post. 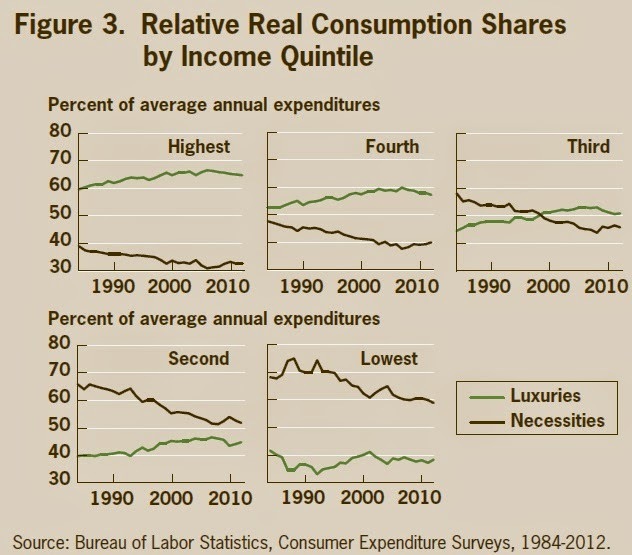 This division is clearly rough and ready, but as Henry explains: "A specific type of good or service is classified as a luxury if more of it is consumed, on a percentage basis, as real income levels increase (that is, going from lower to higher income quintiles). Similarly, a specific good or service is classified as a necessity if it accounts for a smaller percentage of consumption as real income levels increase." What about if we look across income groups? The following five graphs show the share of spending on luxuries with the blue line, and on necessities with the red line, across the five quintiles of the income distribution (that is, dividing the income distribution into five parts with equal numbers of households in each). The share of income spent on luxuries is much higher for the highest-income group. while the share of income spent on necessities is much higher for the lowest-income group. Of course, this is why people in lower income groups are so vulnerable to a rise in the price of necessities. But it's also intriguing to note that since 1984, the share of income spent on luxuries is rising for each income group, and the share of income spent on necessities is falling for each income group. Many people, including me, have a tendency to feel that their hard-earned money should be spent on something fun, rather than having too much of it go to boring necessities like food and gas. One reason the pinch of the Great Recession has felt so severe, I think, is that people have been used to a world where over time they were able to spend more on luxuries. But that long-term trend halted during the Great Recession, and has not yet resumed. Finally, here is Henry's overall list of consumption categories, categories by luxuries, necessities, and indeterminate. 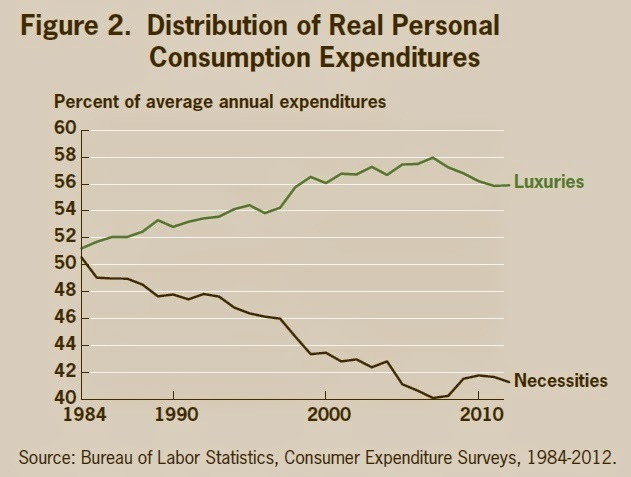 Source: Bureau of Labor Statistics, Consumer Expenditure Surveys, 1984-2012.